First off, forgive my utter addiction to the Potent Calenard War Pauldrons. 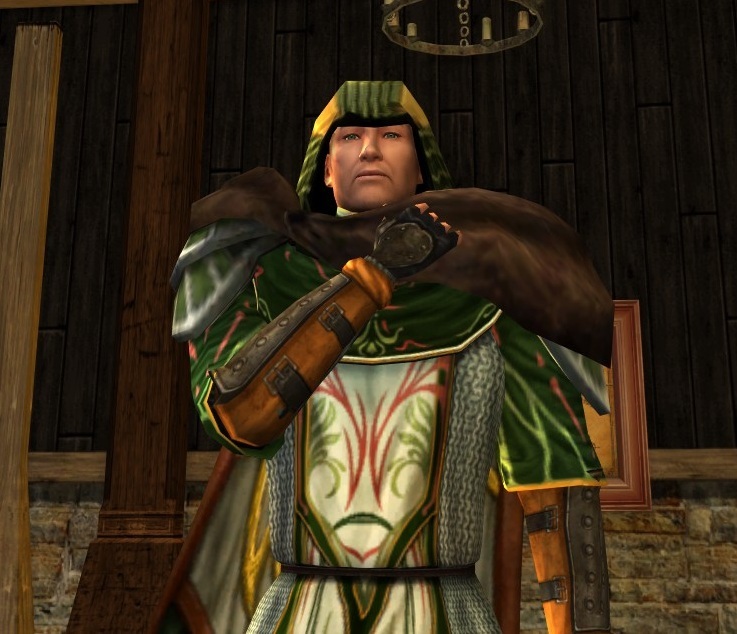 One of the many things I hope Riders of Rohan provides is a few cosmetic pieces beyond hauberks that I can use for my epic! Rohirrim! characters! I revert all the time to my trusty fur Calenards or the Rise of Isengard shoulders, and golly, I’m feeling repetitive. Long may look in vain. My Rohirrim skald is a man of middle years and great distinction, a traveler between the homes of Marshals and great men. He has ridden to battle at his patrons’ side; too, he has composed verse that cuts to the heart of a petty man’s offenses. His voice is rich and pitched to carry in the largest and most raucous of mead-halls. And I know that the Rohirrim seem to be based far more on the Anglo-Saxons than their tormentors the Vikings, but for models of skalds, it’s hard to beat the Icelandic sagas and their creators. Also, I sorta went over the top. 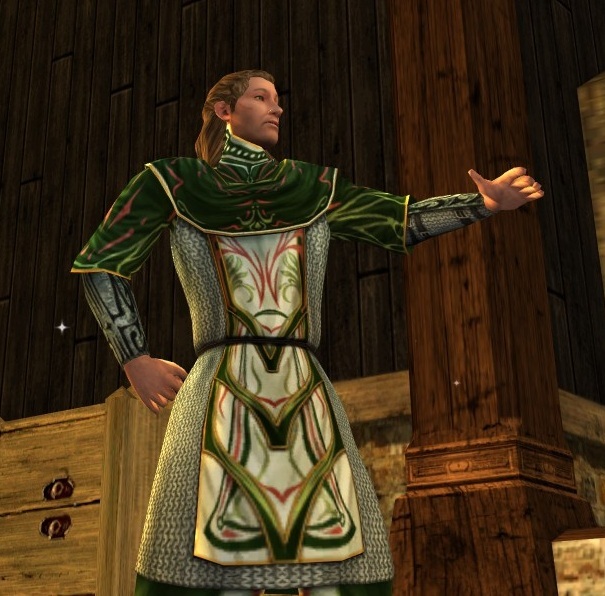 I love the Hauberk of the Greenwood, and despite the Elven reference, the elaborate design on the front of the hauberk reminds me of Viking knotwork. 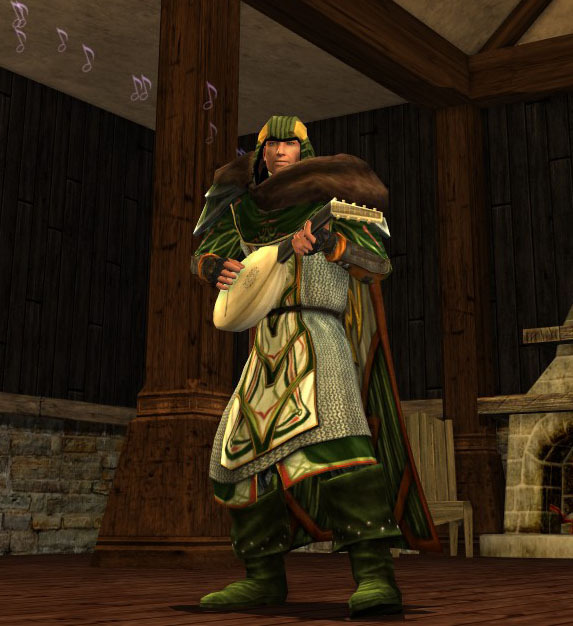 He is dressed almost entirely in olive, except for the rust-dyed Dunland Marcher’s Leather Gauntlets that leave his fingers free for lute or harp or horn. 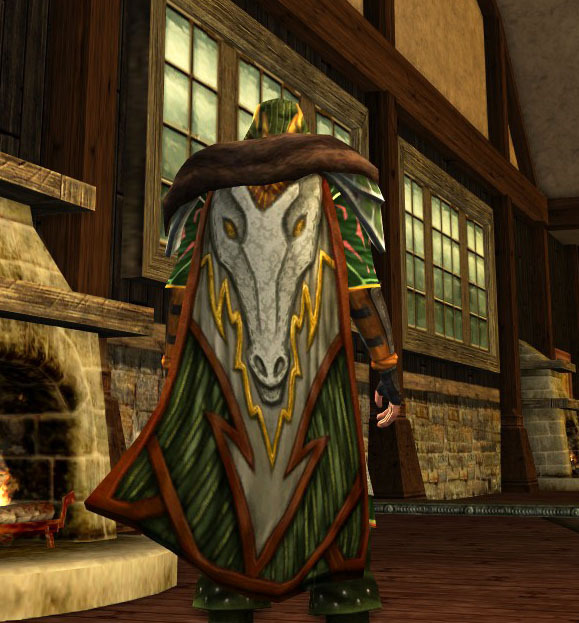 And because I was asked about five times between the vault and the photo shoot site “what is that cloak?” — it’s the Spearman’s Faded Cloak, a quest reward from Trum Dreng in Dunland. It seemed right for a rock star. Whether or not Scandinavian skalds accompanied their poetry with instruments, WE have a vibrant music system and the Professor’s source material, which is so rich in verse and song. Yes, he’s clean-shaven! That’s a deliberate thing, based on nothing except my own brain-place. 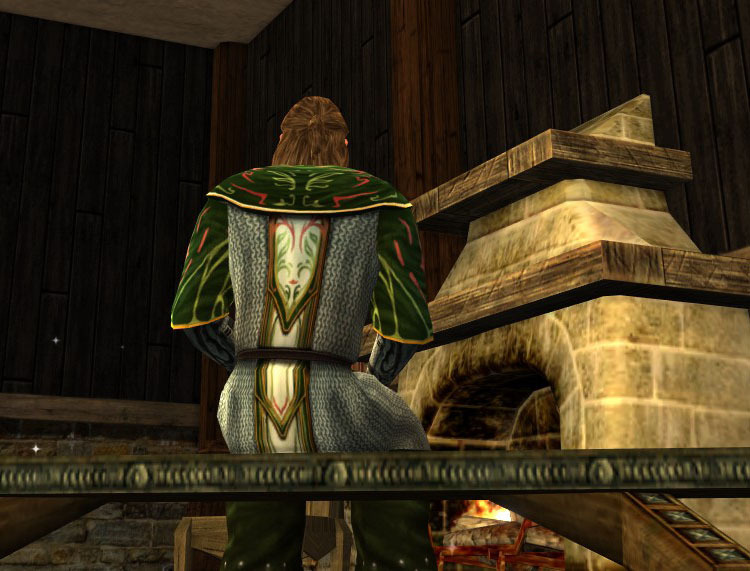 At feast’s end, the skald retires to the fire-side alone, the better to begin his next great work.